Additional research provided by William S. Powell. See also: Ginseng; Venus Flytrap. North Carolina's wildflowers have long been recognized as one of the state's most treasured resources. Native Americans and early settlers valued wildflowers as sources of food and medicine, while today botanists study the role of wildflowers within the state's ecology. An amazing diversity of wildflowers grows within North Carolina. The fire pink, violet, wood sorrel, jack-in-the-pulpit, swamp rose, birdfoot violet, and duckweed are but a few of the state's nearly 3,000 species of wildflowers, some of which have interesting associations in the area or are unique in some way. The blooms of Confederate violets, for instance, are a variegated cream with splotches of violet-gray, often at a glance appearing gray, the color of Confederate army uniforms. The pitcher plant is carnivorous, using the downward-facing hairs of its tubular leaf to trap insects and secreting fluid to digest them. Many wildflowers are found in nearly all counties of the state, including the flowering dogwood (the state flower), rabbit tobacco, the cardinal flower, and the Carolina lily. Other wildflowers are unique to a region. Pinkshell azalea is native to just a few Mountain counties; seaside goldenrod and beach evening primrose grace only the coast. Several nonnative wildflowers have spread throughout the state. The dandelion, ox-eye daisy, Queen Anne's lace, chicory, common plantain, and woolly mullein are among the wildflowers introduced to North Carolina from the Old World. Wildflowers play a vital role in North Carolina's various ecosystems. Sea oats prevent dune erosion, while saltmeadow cordgrass seeds are food for migrating birds. The cattail offers a refuge for the red-winged blackbird to nest; its seeds and stems are eaten by painted turtles; and its rhizomes are food to the muskrat. Bumblebees, butterflies, wasps, and beetles collect pollen from button bush, lyre-leaved sage, and butterfly weed. The early spring bloom of the skunk cabbage is one of the first sources of pollen available to various insects; the rolled-up leaves of the same plant are food to black bears. Wildflowers have also been a source of food and medicine for many North Carolinians. Native Americans found the root of duck potato edible and shared this knowledge with the early colonists. Cherokee women brewed a tea from the partridge berry because they believed it would ease the pangs of childbirth. An extract is drawn from the bark and leaves of witch hazel to make an astringent. One of the most well-known medicinal flowers is ginseng; Native Americans used this wildflower to treat cough and headache. Writings and illustrations dating from the time of the earliest explorations of North Carolina through the present day illustrate a strong interest in the state's wildflowers. In A Briefe and True Report of the New Found Land of Virginia (1588), for example, Thomas Harriot notes the value of sassafras in curing many diseases. Over a century later, John Lawson remarks upon the rich wealth of wildflowers within the state in A New Voyage to Carolina (1709), and John Brickell notes the medicinal properties of some wildflowers in The Natural History of North-Carolina (1737). The watercolors of Mark Catesby in The Natural History of Carolina, Florida, and the Bahama Islands (1731-47) include wildflowers native to the Carolina colony, such as the bay-leaved smilax, the pinxter flower, and the yellow lady slipper. In The Travels of William Bartram (1791), the naturalist describes a visit to western North Carolina in which he saw Cherokee maidens reclining "under the shade of floriferous and fragrant native bowers of Magnolia, Azalea, Philadelphus, [and] perfumed Calycanthus." Reporting on his 1841 visit to Ashe County, Asa Gray, perhaps the most important American botanist of the nineteenth century, writes of observing leather flower, spiderwort, dwarf iris, bluets, galax, and ginseng. In North with the Spring (1951) Edwin Way Teale lists specific wildflowers he saw near Tryon, later writing in detail about four carnivorous wildflowers of the coastal plain near Wilmington: sundew, butterwort, pitcher plant, and Venus flytrap. Several botanical gardens, such as the Botanical Gardens of Asheville, the North Carolina Botanical Garden in Chapel Hill, and the Elizabethan Gardens of Roanoke Island, include wildflowers. Since 1985 large beds of wildflowers have been sown along state highways as part of the North Carolina Department of Transportation's Wildflower Program. J. Anthony Alderman, Wildflowers of the Blue Ridge Parkway (1997). Dunes of Dare Garden Club, Wildflowers of the Outer Banks: Kitty Hawk to Hatteras (1980). William S. Justice, C. Ritchie Bell, and Anne H. Lindsey, Wild Flowers of North Carolina (2nd ed., 2005). Albert E. Radford, Harry E. Ahles, and Bell, Manual of the Vascular Flora of the Carolinas (1968). 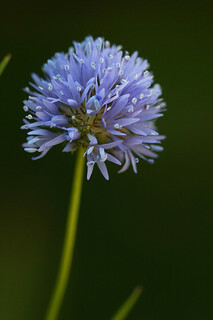 Blue Thimble or Globe Gilia, a North Carolina Wildflower. Image courtesy of Flickr user Philip Bouchard. Available from http://www.flickr.com/photos/pbouchard/4292103223/ (accessed August 27, 2012). 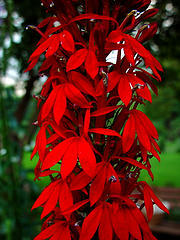 Cardinal Flower. Image courtesy of Flickr user Zen Sutherland. Available from http://www.flickr.com/photos/zen/807625/ (accessed August 27, 2012). 1 January 2006 | Foote, Margaret; Powell, William S.